Your music library is automatically sorted into various groups such as Artists, Albums, Genres, etc. While it is possible to use a hard disk drive or even an SSD via USB enclosure, USB flash drives are the way to go – both being small, fast, economical and easy to use. Notes: Approximation based on 4 minute songs. 128 kbps/256kbps are for compressed, lossy AAC and MP3 formats. FLAC is at a 16-bit/44.1kHz lossless “CD” quality and will vary depending on music and other factors. WAV/AIFF is lossless and non-compressed 16-bit/44.1kHz. There are a large number of flash drive packaging styles, but you’ll likely want one that is either low-profile or a cap-less stick design. 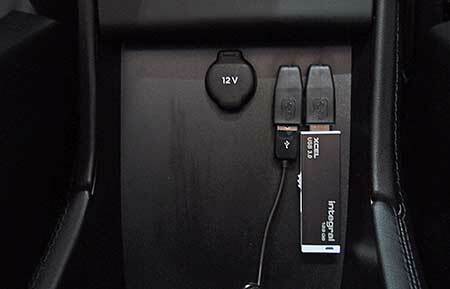 Avoid unusual shaped bulky drives as it may block access to the second USB port on the Tesla. Low profile drives are more limited in capacity so a stick drive may be your only choice. For cars with a console and using a stick drive, you might get a short 6 inch left-angle extension cable (not shown). If you have an older car without the console, we recommend a Left Angle USB Adapter so that the stick lays flat rather than sticking out. Often drives come in flashy colors or chrome. While clearly a personal preference, consider one that doesn’t stand out to keep the drive less obvious to possible thieves if you car does not have the Tesla center console. For playing music, the drive performance is not an issue, as slow drives will work fine in the Tesla. The big difference is when Tesla needs to index your library. The scanner needs to look inside every song file to extract embedded tiles, albums and other details. A fast drive allows this process to take minutes instead of hours. A fast USB drive is also handy to speed the loading and updating your music from your PC or Mac. For a real world example, a slow USB 2.0 drive that writes at about 1.3 MB/second took 25 hours to copy 120 GB of music! A fast USB 3.0 drive at 40 MB/second only took about 50 minutes. I didn’t notice much difference when playing from either drive in the Tesla, although track to track seems slower with the slow drive. USB 3.0 offers the potential for faster read and write times, but DOESN’T assure it. Assume any drive that doesn’t specify read and write times as being dead slow. Also you can use a USB 3.0 drive in a USB 2.0 port (like offered on the Tesla), but with a fast USB 3.0 drive, you’ll get the best performance using a 3.0 port on your PC/Mac. Almost every new PC/Mac today offers at least one 3.0 port. Price difference is minimal now, so I’d strongly consider 3.0 drive over a same sized 2.0 drive, even if you don’t have a PC/Mac today that supports USB 3.0. Fake USB Drives – Don’t get Taken! The majority of USB and SD card type flash drives that are unknown brands, no-names and most drives appearing on auction sites are fakes. Price is no indicator, although those too-good to be true are always fakes. Scammers have taken rejected drives and/or low capacity drives and modified the drive to look like a far larger capacity drive. In reality, only a small part of the drive is useable. Sticking the drive in Windows or a MAC will show the purchased capacity, and you can even write a huge amount of data to the drive without any apparent errors. When you go to read the data, much of it will be missing or corrupted. The second common trick we’ve seen is labeling a slow USB 2.0 drive as a USB 3.0 drive. They may even use the newer ‘blue’ 3.0 style connector, but inside it’s a crappy slow 2.0 drive. White or black connectors are normally associated with USB 2.0. Even if they use the right hardware, the fake drive could be a fraction of the stated speed. The last aspect of fake drives is the lifetime of writes may be dramatically lower than those from reputable manufacturers. This is not much of an issue for storing music that is updated infrequently, but is more important for other applications such as storing dashcam video. Scammers are hoping you do not discover the drive is far smaller or slower than you thought until long after they are gone and you can’t get a refund. This is a rampant problem and it’s so bad that you should only buy a drive from a reputable company like Amazon (direct from Amazon, not through resellers), BestBuy, Costco, Newegg, etc. and stay away from a brand you never heard of before. Even well-known drive companies have seen many counterfeit drives flooding the market through auction sites. There are a few free tools to detect the true working size of a drive, but they require the drive to be empty, as they need to write data to confirm the true capacity. I like RMPrepUSB as it’s a bit quicker than others I’ve tried. When installing be sure to select English (German is the default). To use it, if the drive is greater than 128 GB, go to Settings and click on List Large Drives > 128 GiB. Next select the USB drive in the window (usually only the one drive), and then select Quick Size Test. The test will overwrite data, so be sure there is nothing you need to keep on the USB drive. After several prompts, a command box opens where the test runs. There are long periods with no visible activity. This is normal. After every 5% of the test completes, an estimate of the time remaining appears. It may take an hour or more for a large drive, but when complete, it shows the true USB drive size. We recommend the following drives that are available on Amazon and other retail stores. Any of these should work great with your car. Notes: Speeds are from the manufacturer, and believed to be accurate. Costs typically go up as the speed and size go up. Most drives 32 GB and under are pre-formatted for FAT32. 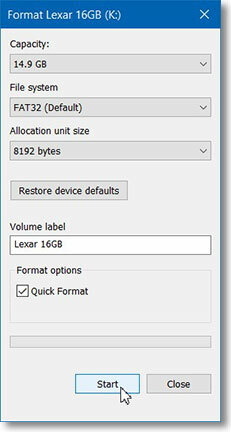 Larger drives may be FAT32, exFAT or NTFS. Only drives that are formatted for FAT32 (or Linux ext4) can be seen by our cars, so if it is in exFAT or NTFS, you’ll need to reformat it (which will erase all the data on the drive). With Windows on drives at or under 32 GB, open Explorer. In the left pane, right-click on the USB drive and select Format. BE ABSOLUTELY SURE you selected the USB flash drive and not another hard disk. Set the File system to FAT32 and click Start. 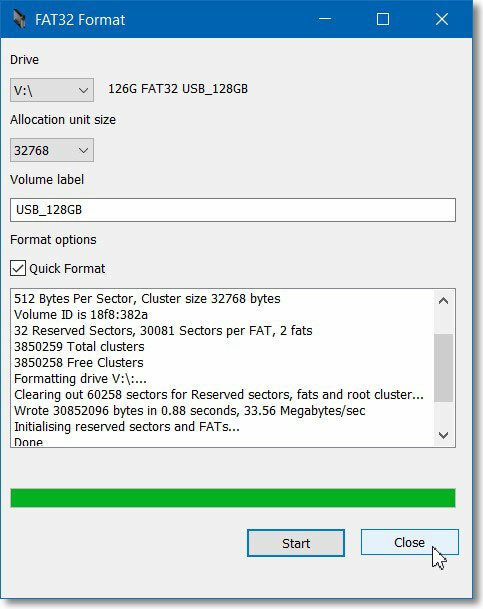 For drives larger than 32 GB, to use FAT32 (not exFAT) you’ll need a third-party utility, since Windows doesn’t allow formatting FAT32. One free product we like is GUIformat, which is really simple. Click on the image on the web page to download the program. Run guiformat.exe (there is no installation). 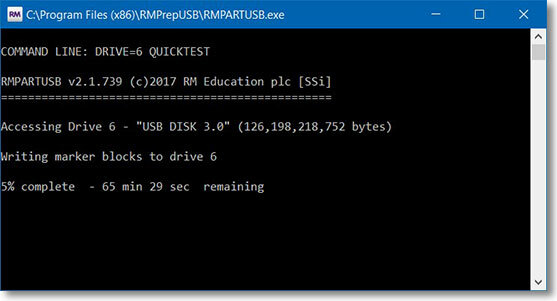 You can also use the free RMPrep program listed in the fake drive test above to reformat the drive. 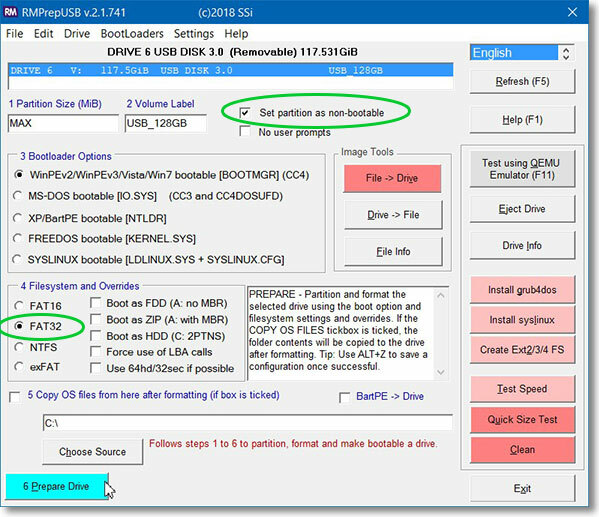 Using RMPrep, with the flash drive selected, check the box “Set partition as non-bootable” and in section 4, select FAT32. Then click on the teal button “6 Prepare Drive“. Open Finder, search for Disk Utility and select. On the left pane, select your flash drive. Be absolutely sure you’ve selected your flash drive and not the hard disk! Click Partition to identify the current format. If not “MS-DOS (FAT)”, click Erase. Select MS-DOS (FAT) as the format. Note that Apple makes it a bit confusing as “MS-DOS (FAT)” is really Windows FAT32. Click on the lower “Erase…” button, and a confirmation dialog appears. 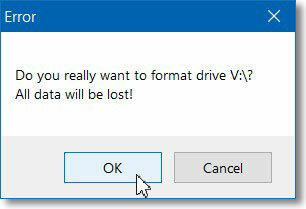 Click the Erase button and the format should begin. We recommend FLAC, as it is a lossless format, especially if you are ripping your existing CD library. Drive capacity is so cheap now it makes little sense to use lower quality formats. Currently very few download sites offer FLAC, so you may have to live with lower quality MP3 or AAC files for downloads. There is no problems with having a mix of FLAC, MP3 and AAC files on the same drive. The proprietary Apple Lossless format is not usable in the Tesla, although there are programs that can convert these files into playable FLAC files. One popular converter for the Mac is X Lossless. Another converter written specifically for us Tesla owners is TeslaTunes. Apple’s proprietary M4P (with Digital Rights Management) will not work in any player other than those made by Apple. Apple’s less restrictive M4A format, more common nowadays, may work depending on the drive or you may get “Loading Error”. We’ve done quite a bit of testing with M4A and can state this Lexar 256 GB drive does play M4A files well. We haven’t found a common reason while some drives do not work well with M4A files, and it is not related to drive performance, read speeds or USB 2 vs USB 3. If you have Ultra High Fidelity Sound option (with MCU1), you may want to turn off Dolby Surround. This sounds counter-intuitive, but this option attempts to convert the stereo audio into 5 channel audio. This tends to distort the sound in a bad way prior to software 2018.12. Very few owners liked this option for music. A dramatic improvement was made in 2018.12 to Dolby Surround, so it may be worth a try. Note that it works best with the fader centered, and will sound weak if the fader is shifted to towards the back, like shown below. MCU2 (in cars manufactured starting in March 2018) has replaced Dolby Surround with “Immersive Sound”, which is presumed to be a similar stereo to 5 channel conversion and works far better than Dolby Surround in our opinion. 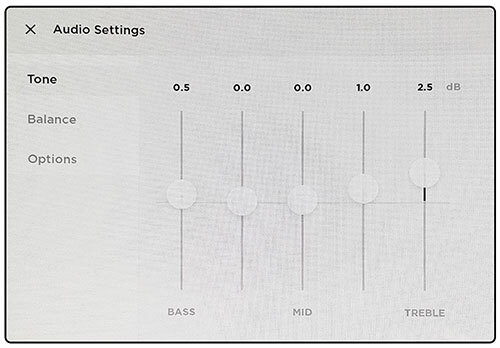 Adjust the equalizer for the tonal balance you prefer. The tone controls set at the center (no boost and no cut) is the best starting point. At a minimum, check the controls to verify someone else didn’t change your desired settings. Note that the more extreme setting of the equalizer will add some distortion to the sound between the bands – true of all equalizers. Best to take a light approach. The Tesla also offers a slick four-way balance fader. In the cabin image, touch and move the round crosshairs spot to change the sound field . Here are some of the issues owners have had on occasion and how to fix them. These are issues through software 2018.16 (May-2018), and may be improved in a later release. This occurs when you use a non-supported format, such as Apple’s proprietary M4A with digital rights management. You will need to convert these files to an open standard such as MP3 or FLAC. Apples M4A will work, but some USB drives work better than others and eliminates the Loading Errors. See part 2, “Formats” above for more about this. In very rare situations, we’ve seen the Loading Error on files that have worked fine before. Doing a reboot corrects this. Press both scroll wheels in until the center screen goes black. Booting takes about 60 seconds, but the USB drive needs to be rescanned, which may take a few minutes. Tesla does read the embedded track information and track numbering and works fine when playing albums from the Albums menu choice. If you use the Files choice, within a folder it will read songs in alphabetical order of the filenames. In many cases the filenames will start with the track number – so they play in proper order. In other cases, if the filename is just the song name, the songs within the folder will not be in the orignal track order. Files purchased from Amazon use a filename format with the track number first. You can also rip CDs with programs like MediaMonkey to include a the track number at the start of the filename. Also confirm you didn’t turn on the option for random track order. Tesla uses the album art embedded within the song files. Some programs fail to include the album art and/or only include the album art as a file in the directory of the album (which is ignored). You can use our free TORG utility (Windows) to scan all the albums on a USB drive to find missing embedded artwork or generate a list of all artists and albums. TORG can also organize your music into alphabetical folders, but this feature is not important with the current Tesla software. Assuming the correct artwork is embedded in the music file, we’ve seen this rare condition when you are playing via the USB, then reboot, and while the USB drive is being scanned, you select another source such as Streaming. Once the USB completes the scanning, it may switch back the last song that was playing from the USB, but the cover art does not update. Usually after you get to another song, the correct cover art appears and it works fine from that point. I guess I should have made this clear from the very beginning. Here’s what’s happening and here’s what I’m trying to do: I copied almost my entire music library in iTunes from my desktop iMac to a USB drive. My music library consists of ripped CDs and purchases downloaded from iTunes. When I attempt to play a track on the USB that I know was a music download from the iTunes store, I get a “Loading Error” message. What I’m trying to do is convert all those iTunes Store music purchases now on my USB drive to a format that the Tesla will understand. Where do I start? Thanks in advance. There is a known problem with Apple’s M4A file format on Tesla that cropped up a few months ago with the major OS upgrade in the Tesla system. Tesla is aware of it, but I don’t know when it will be solved. That’s one reason I always recommend FLAC, as it has always worked perfectly and is not a proprietary format. For a computer luddite like me, converting iTunes music files into a playable format that the USB drive will recognise is such an aggravation. I think I’m stuck listening to the muddy sounds of my iPhone music library via Bluetooth. Yuck. Yep – it’s too bad Apple makes it so difficult. They have a good product, but they seem to hate working outside the Apple sphere. I got a message saying that the TeslaTunes download link “IS NOT PRIVATE,” and that I should go back. Should I believe it? Again, sorry I can’t help TeslaTunes. 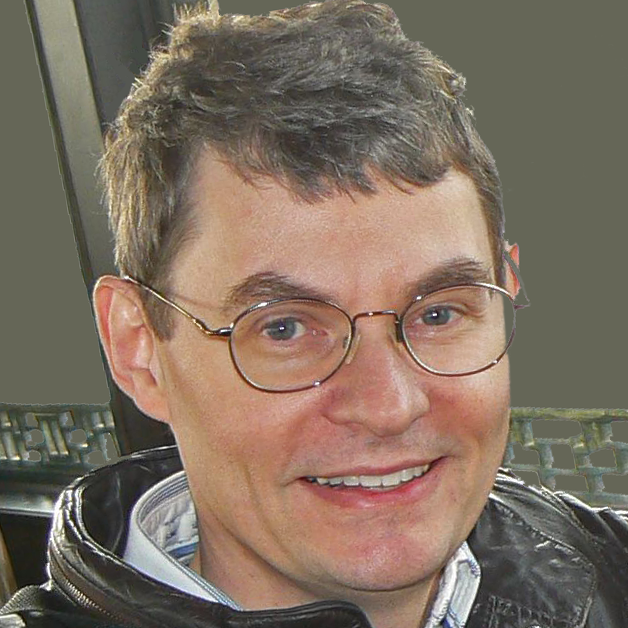 This is the author of the TeslaTunes app. I looked at the link included on this page, and it looks good – it’s simply a link to the github project itself. You can go to the app’s homepage at https://teslatunes.loci.net but it’s just the github hosted project website, and you’d end up following the link to download the app from the github release anyway. I just saw your reply. Thanks so very much. By the way I just ran your Tesla Tunes for the first time, with some success, even managing to reformat the USB drive to EX-FAT. However, what can I do about the 134 m4p files that were skipped, and the 3 m4b files that were also skipped? My model S in production. Currently have iPod (several years old) which I play music on my Honda via usb. Will this work on the tesla? Also have music on my iPhone 7. Will this play via BT even if connected to USB? The iPod is doubtful – it needs to look like a standard file system when connected via USB. I don’t think iPods provided that feature. The iPhone will work fine via Bluetooth, even if connected via USB for charging. Tried to download X Lossless onto my desktop mac from Cnet.com but my Mac won’t let me. Something about not having my approval. Maybe I need to go into Privacy and Security settings. Okay, got past the security thing. I’ve even managed to import a few tracks into XLD. But I don’t know what to do with them. I wish I could watch something on youtube, or somewhere, about how to use this programme. Thanks for the link. It was instructive except now FLAC is not even a selection in the dropdown window. There are only five formats to choose from. I posted a question about this on the youtube video but the one who posted the video hasn’t answered. Sorry, I’ve never used TeslaTunes. I’m only providing a link to it as others have had success with it. Most of the music servers,(say iTunes, Roon, JRiver, etc.) clubs tracks based on Album name and Album Artist. Any idea why Tesla does otherwise ? This is very inconvenient as this breaks an album to multiple albums if the album has different performing artists from each track. You cannot play all songs of an album at one go. No idea why they did this. I also find it somewhat annoying. Best work around is to have the files organized in folders as artist, then album (this seems to be the standard organization for most libraries). Select “Files” from Tesla and you can go to a specific album and play all the songs from that album, even with different artists. The only downside is they are played in alpha order of the track name, not the original track order. You can select random as an alternative ordering, but you can’t play it in the original album order using “Files”. Any chance that a program like TORG allows one to rename individual songs within an album (e.g. “I Me Mine” becomes “04 I Me Mine” and “Let It Be” becomes “06 Let It Be”? Some things in life shouldn’t be messed with, an artist’s prerogative to order his songs for public consumption in a give order being at the top of that list. TeslaTunes allows some renaming for playlists as you describe. It used to work well for getting a playlist copied into a folder, then showing the files in playlist order (anything other than file view and Tesla would resort them for you). That said, not sure it’d do what you want, and from what I hear, the car doesn’t necessarily display file order by file name now, but instead does a sort on the title tag in the file. You should have the option of FOLDERS, in addition to the SONGS, ARTISTS, ALBUMS categories. Those do keep the “album” intact and does not separate it out by artist or track within that album. I know that has been a frustration for me as well, and I don’t like having to work the screen that much when I drive. I’m looking at different ways of copying the files onto a flash drive to see if the interface will handle it better. I’ll let you all know if I’m successful. This week, I started having issues with the touch screen on my 2016 Model S. I could not load podcasts, the screen was laggy and unresponsive to touch, and it went black a couple times spontaneously. I rebooted it twice, with no change. So I called Tesla, and after they ran some remote diagnostics, they told me I needed to get rid of my USB drive (Lexar 128GB) and replace it with a lower capacity device because that was causing the problems, because it was too big. I told them I had been using the drive starting only a couple of weeks after buying the car (12/16). I asked how large a drive I could use, and nobody knew. I removed the drive, rebooted the touch screen and all appears to be well, except now I have none of my music. I have a Mac computer and when I go to the disk utility with the drive hooked up and click on the drive, the option for “partition” is grayed out. When I right click on the drive in the finder window, it says the format is FAT32. I’m starting from scratch and reformatting and using your TeslaTunes app to copy the music again, and will update adfter doing so. What are your thoughts on Tesla saying that the thumb drive is too big and will cause the touch screen to malfunction? They asked how big the drive was, and they seemed astounded when I told them 128GB. The size of the drive is unimportant (I’ve been using a 256 GB flash drive in an old 2013 S and a late 2016 S without an issue). The number of songs on the drive can be an issue. I have about 8,000 songs (mostly FLAC), but you could have 20-30,000 songs if highly compressed. The car needs to build an index of all the songs, and at some point it just doesn’t have enough memory, and odd behaviors start to occur as memory gets low. So you might try limit your collection to 10,000 songs or so. We do not know what the limit is, but others have reported problems at the 20,000 song level. This may vary by car too, as we suspect older cars may have less memory. A minor note – TeslaTunes is not our product, but we only provide a link to it. Others have had good success with the product on Macs. I can’t get it to read in my 2017 S. Tried another random USB stick I had lying around and that worked so it’s not the port. I also moved some of the files from the 3.1 stick to the old stick and they played fine. (FLAC files). I formatted it to Fat32, tried ExFat as well. I can only guess the car doesn’t read USB 3.1? I’ve not used any USB 3.1 drives, but the SanDisk site claims it is 2.0 compatible, so it should work. Sounds like you did everything right. 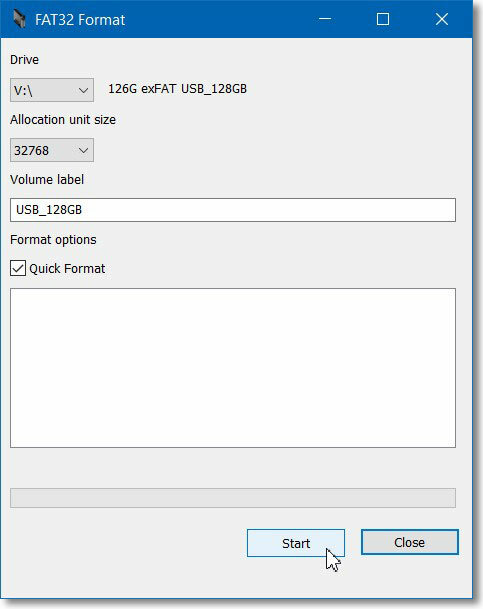 I know exFAT will not work – you need FAT32. The standard Windows format will not format to FAT32 beyond 32 GB, so I presume you used a different utility to ensure it really formatted as FAT32 and not exFAT. I used a mac and formatted it to FAT32. No idea but could not get it to work or even see it in my car. Worked fine on the computer. I ordered the 3.0 version and it works fine. And I’m using the 64GB SanDisk Extreme Go USB 3.1 in my 2017 MS. It works fine after reformatting it from exFAT to FAT32, but I haven’t gotten around to copying a really large number of songs to it. Nevertheless, it IS recognized and DOES play songs in a variety of compression formats. I DID have to reformat it on my Mac from exFAT to FAT32 for it to be recognized, though; the thumb drive wasn’t even showing at all in the Music app when I plugged it in before reformatting. Yep, FAT23 is required. Glad you got it working! skivvie, thanks for your comment on the SanDisk Extreme Pro SDCZ880 USB 3.1 drive. Did you have any problems fitting your SanDisk drive in your Model 3? One of my prerequisites before purchasing a Medel S one year ago was a music system which could manage and play music from my 256Gb USB drive. With version 8 software my USB takes several hours to load. The load process restarts every time the vehicle is parked up overnight effectively making my USB unavailable. Does anybody have a solution before I ask Tesla to take the car back and refund my money. Splitting my music library onto several smaller USB’S is not an acceptable solution! My 256 GB flash drive takes about 5 minutes to load and is very stable (i.e. no reloads unless I remove/reinsert the drive). I suspect your USB drive is exceptionally slow. The cheapest flash drives are always dog slow and often partly defective. Many of the no-name flash drives only hold a fraction of the stated size and cause all sorts of read errors, which then takes forever to be scanned. Anyway, I expect your issues are with the drive and not the Tesla. With ver 8 update, I can’t load my 128 linyx (started to do to get larger files on drives and worked great with ver 7 software) formatted drive unless Tesla is on for a least 1-2 hours. Every time I restart car it starts loading again. Tesla said they programmed to turn audio off when you leave car (dumb). I finally got 2gb portable hard drive to load before update and now it will take hours with car on. Any ways around this? The v8 appears to have needed memory for other features (AP?) and reduced that available to the USB indexing. It is likely a lot more to do with the number of songs and not the USB size. I use 130 GB with 5200 songs without a problem (mostly FLAC). Another user has 19,000 MP3 songs on a 128 GB drive and it has major rebooting issues. The only solution right now is to reduce the number of songs on the USB. The size of the USB is not important. I’d also avoid using a USB hard drive, as it’s dreadfully slow. A fast USB 3.0 flash drive can do wonders. My 5200 songs are scanned in about 5 minutes (slower than Tesla v7.1 software, but ok since it only does it when first inserted). I am using the 1 TB Seagate Backup Plus Slim in the Model X (using driver side USB as I have read it gives more current). I just got my car this weekend so I only have 900 songs loaded on it. It works great though. Did not want to go the small stick route because I want to play 192kHz/24-bit FLAC files purchased from HDtracks, which I am proud to say work just fine, artwork and all. I do have the premium sound system. One question I have is that I don’t see any option specifically around Dolby. However there is an “Immersive Sound” setting which can be Off, Standard or High. High sounds bad, I’m still comparing the difference between Standard and Off. “Immersive Sound” appears to be a new label on “Dolby Surround”. I haven’t seen/heard it yet, but my guess this is the old Dolby Surround. It’s a good idea to play with it and see how you like it. My guess is the clearest, high-quality sounds will occur with this option off. Is the recommendation re turning off Dolby still accurate based on current firmware (7.0.x.x.x)? I’ve not tested it with 7.0, but I don’t expect it to improve with any software update.